Beat butter and sugar until fluffy, add eggs, one at a time and mix well after each egg. Add vanilla. Sift dry ingredients and add alternately with buttermilk, mixing well after each addition, beginning and ending with flour mixture. 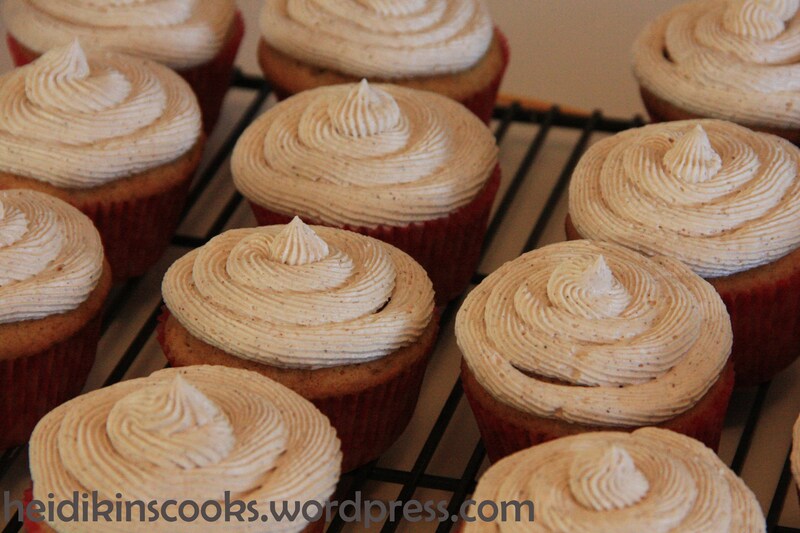 Line cupcake tin with papers, fill each 2/3 full of batter and sprinkle with cinnamon sugar. I got 24 regular sized cupcakes and 24 mini cupcakes out of a full batch. 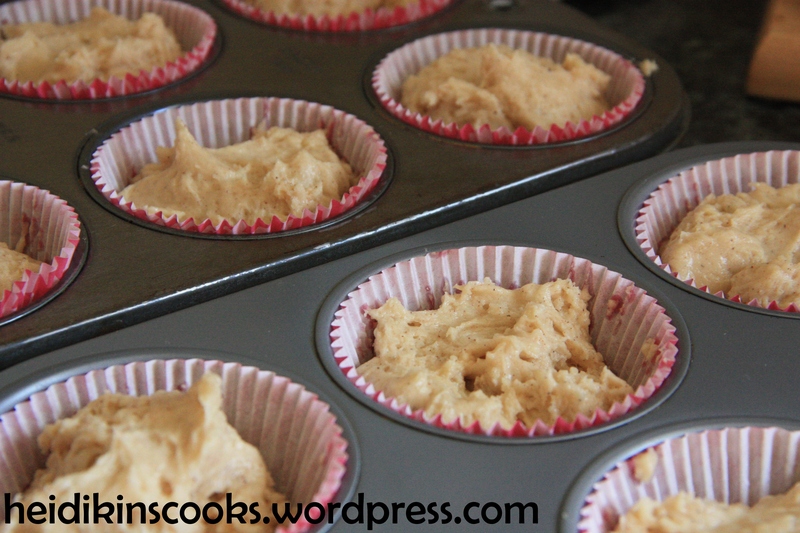 Bake 20 minutes, remove from oven and let cool 5 minutes in pan before removing cupcakes to a wire rack. Cream butter and 1 cup of sugar until fluffy, add remaining sugar slowly, mixing well. Add rest of ingredients and beat until fluffy and delicious–about 3 minutes. I have done this with a hand mixer, although it is infinitely easier in a stand mixer with the whip attachment. When cupcakes are completely cooled, it is time to frost. Using a frosting bag (or ziploc with a frosting tip) is easier and faster than spreading the frosting on with a knife. So that’s what I did with the largest tip I had and a frosting bag. (If you have frosting bags, they are much easier than ziploc bags, they twist easier to remove any air pockets in your frosting bag, and they fit in your hand better. Well worth any clean-up hassle, and that is coming from a girl without a dishwasher. However, if you are going to go the knife route, you should cut the frosting recipe in half, knife-application uses far less frosting than piping it on with a bag. ← The (pseudo) cook is back! 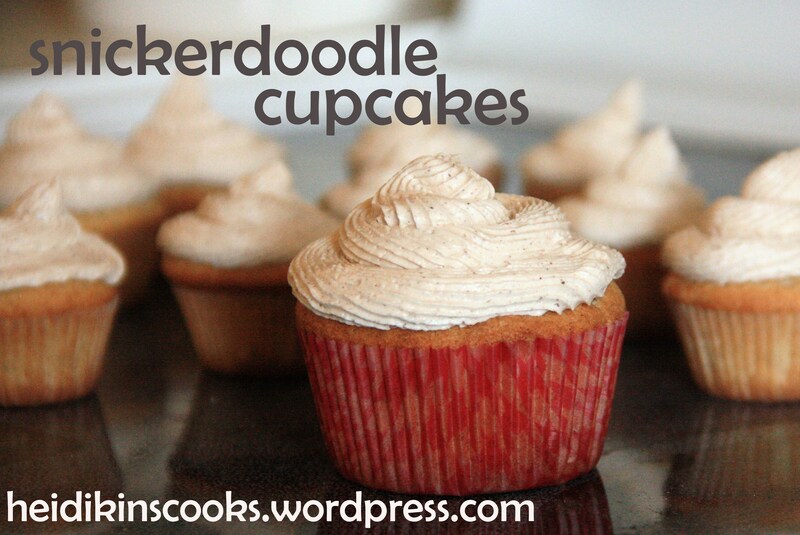 Snickerdoodle is totally my favorite cookie, so my interest is super piqued in these! And they look so pretty. Yum!